“The Magician” will be back to perform his combat tricks inside the Octagon in October for the stacked UFC 166 event in Houston, Texas. The Jackson-Winklejohn prized product John Dodson (14-6) will welcome UFC newcomer Darrell Montague (13-2) into the Flyweight division. The fight will be part of a loaded fight card featuring the Heavyweight Title Fight between Cain Velasquez and Junior Dos Santos. Also expected on the card, Dodson’s teammate Diego Sanchez taking on top contender Gilbert Melendez. Dodson is looking to bounce back from a January loss to Flyweight Champion Demetrious Johnson which ended Dodson’s five-fight win streak. Prior to that bout, Dodson had an impressive run in the UFC with finishes over T.J. Dillashaw, Jussier da Silva and a unanimous decision win over Tim Elliot. 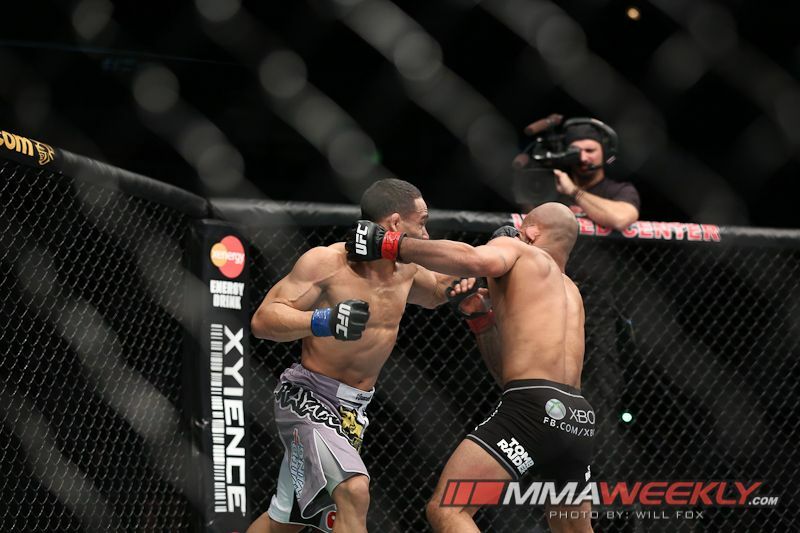 In his title fight with Johnson, Dodson very nearly captured the gold as he knocked down Johnson several times with powerful punches. The fight was razor thin and aside from a draw earlier in Johnson’s UFC career, Dodson has been the closest to dethroning Johnson from atop the 125-pound Flyweight division. Montague is a Tachi Palace veteran whose last loss came at the hands of UFC Flyweight Ian McCall. In his run since, he has gone 3-0 with all of his victories coming by way of a finish. He was once the promotions champion, defeating Ulysses Gomez and has since been considered one of the division’s premier fighters as well as being regarded as the best Flyweight not-signed by the UFC. The bout should be an explosive one and a win for both fighters represents huge implications as victory over the other propels them atop the Flyweight ladder. Stay tuned to SWFight.com for more UFC 166 coverage, fight breakdowns and analysis.